Prayagraj, March 21: Holi is not only a festival of colours, but an opportunity and occasion where people forget their enmity and hug each other with smiles. 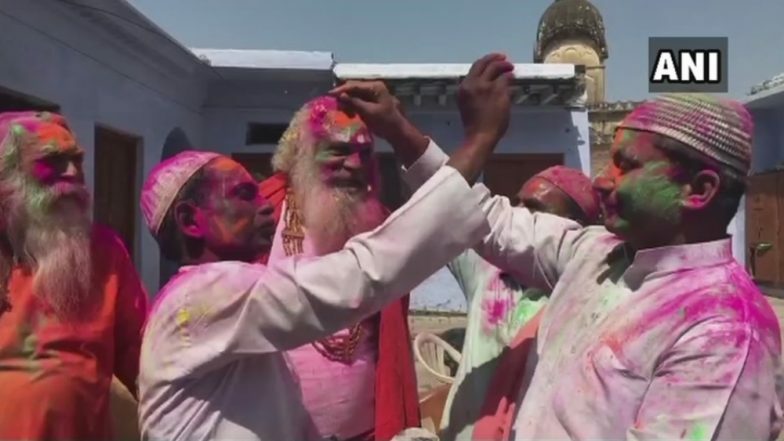 In the latest, Ayodhya case litigants Mohammad Iqbal Ansari and Mahant Dharandas were seen playing Holi in the temple town of Prayagraj on Thursday. Not only they shared the stage, but also put colours of each other face, wearing a smile. With this, the speculations are rising that the possible solution to the Ram Janmabhoomi-Babri Masjid Ayodhya title dispute case is on the offing. Holi 2019: Yogesh Verma, BJP MLA From Lakhimpur, Shot at After Argument During Festivities. It is to be known that in order to solve the decades-long dispute over the land, Supreme Court appointed a three-member committee consisting of former Justice FMI Kalifiulla, Sri Sri Ravi Shankar and senior advocate Shriram Panchu. Though objections were raised by AIMIM MP Asaduddin Owaisi and Nirmohi Akhara over the appointment of spiritual guru Sri Sri Ravi Shankar in the Supreme Court-appointed panel of mediators, it is expected that the matter might be solved through dialogues this time. The apex court is hearing of a batch of cross-petitions challenging the 2010 Allahabad High Court verdict trifurcating the disputed site and giving one party each to the Nirmohi Akhada, Ram Lalla and the Sunni Waqf Board.